Now, there are some users who would benefit greatly from Windows XP, but some who would need to strongly & skeptically consider whether they wish to upgrade at this time. For example, you need, in our estimation a late-model computer with a fast processor and lots of RAM as a minimum. (I've seen XP run on a 400MHz box, but I wouldn't make my kids sit through that....) Also, plan on having 1.5 GB less space on your harddisk after the install of WinXP. Don't put this on a dinosaur!!! Now, don't get us wrong. Windows XP is a neat product, the culmination of several years experience as the #1 distributor of operating systems in the USA, if not the world (but let's not start on the market share issue, OK?) It's just that some people won't think too clearly about an upgrade, and do it for poor reasons and cause themselves grief; and others will think a lot about it, but, armed with less than adequate information about XP, will cause themselves grief. So, let's discuss some common situations, and the OS itself, and hope we can avoid some issues we've seen so far in the 6+ months that XP has been available. First, this note: Windows XP is NOT the same animal as the Windows you've been using before. Windows 3.1, Windows 95, Windows 98, and Windows ME were all based on the DOS filesystem and kernel/command shell. Windows XP is based on Windows NT (which also gave us Windows 2000) and uses the NT filesystem (NTFS) and NT kernel. This seems good --- the NT kernel has a reputation as a much more stable entity, which translates to less crashes. You'll probably see a lot less of the "Blue Screen of Death" with WinXP. True to form, Microsoft has released an extremely integrated package with Windows XP. You can use a wide range of applications (programs) to do just about whatever your computing heart desires. However, don't let Windows make you lazy ... keep on the lookout for 3rd party software ... many times there is something better out there if you just look for it ... just find out before you buy it if it's XP compatible. I am continually surprised by people who think that everyone is the world likes to read HTML email from their Outlook Express program, that the "Internet" is only what shows up in their "Explorer" window, or that Windows MediaPlayer is the be-all, end-all of .mp3 players. But, if you buy Windows XP, you'll get all these apps, and many more. Well, enough introduction --- let's see what we've learned thus far from Windows XP. First, Windows XP is pretty bulletproof. I have hardly seen the BSOD, and nary a lockup do I recall. I have a sadistic friend who renames and deletes .dll files and other system goodies for fun and profit (actually, to see if he can crash systems--he's a little sadistic, and he had a hard time killing XP.) No matter what he did, the operating system discovered the error<s> and fixed it <them> "automagically." Also, it seems you're not as likely to see 'invalid page fault,' illegal 'operation' or 'unknown' errors as you did with Win98. For most people, that's good news. Here's a review by an editor who prefers the Mac, but liked XP. Next, consider the issue of hardware compatibility. Windows XP comes with "digitally signed" drivers for a large number of devices. These drivers have been verified by Microsoft and the hardware vendor to work with Windows XP. If you have one of these devices, Windows XP will recognize it immediately and set it up with a perfect device driver that works without any problems or errors. However, some users have older hardware, for which the vendor will never attempt to gain "signed" status, and other companies will never even write an XP driver for that old device because they don't sell those devices anymore. And this article doesn't even begin to explain about the companies that don't want to go to the trouble of having Microsoft certify their drivers, so they just tell you to ignore the messages that XP tells you. The bottom line here: go to your hardware vendor's website (for EVERY device you plan to use with XP) and find out if the device works under XP, which drivers you'll have to use, and any other issues regarding your device and WinXP. Finally, there's the issue of security. 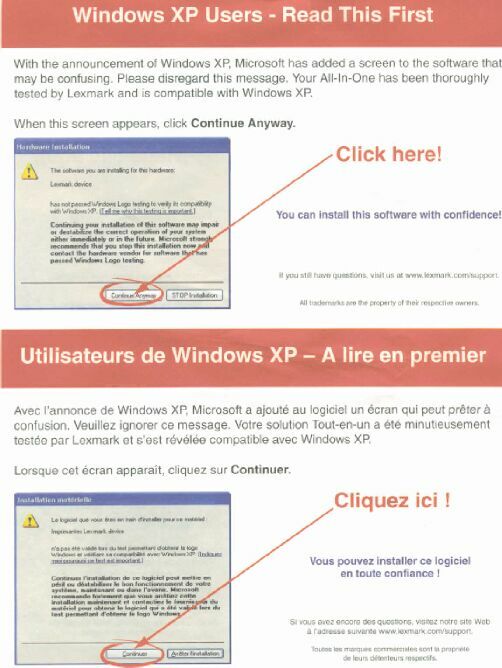 Windows XP's "Universal Plug 'n Play" feature is cool, but was discovered, almost upon release, to have a huge gaping hole that would allow users from anywhere on the internet to gain access to most of your devices via TCP/IP (Internet Protocol). (Do you want to print messages for the woot-project?) If you use XP, the FIRST thing you should do is patch the system. And, you should check for patches OFTEN at the Microsoft website. Finally, let me tell you our biggest horror story. A local 2-person office for whom we have done some service bought new Dell computers, running WinXP, without doing much homework on it. This office runs a "peer" network via a crossover cable, scanner, printer, multifunction machine. They wanted us to come in and set-up the systems. We dealt with hardware issues (the multifunction machine was not XP compatible) and software issues (neither was their primary document software, or their document scanning program, or their old QuickBooks) and what should have been done in 1.5 working days or so stretched into a rather longer period of time. In the end, they had to add a couple hundred dollars to their upgrade cost for consulting services, convert to using some different software in some cases, and speed up the acquisition of a new printer (although they did get a nice one...) They're pretty happy now with their purchase (there were upgrading a 266 and a 500MHz computer) but there were some times when they were definitely NOT happy, and they had to do some adjustment of their technology budget, and that even though, as a religious organization, we gave them a substantial price break on our services. I haven't even begun to discuss the "Big Brother" issues (registering your software with Microsoft) or the .NET initiative (Microsoft wants to be your total computer solution --- and your dishwashing service, refrigeration control, HVAC/climate control, telecommunications company, media provider, etc. etc.) but I hope you see that you owe it to yourself to check up on things before you make changes to your current computer setup. WinXP can help you; it could also hurt you. If you have more questions you'd like to ask, feel free to send us some email. Read people's opinions about XP here. Try and figure out who did what wrong.